I enjoyed seeing Deb’s Critical Lass pictures last month and I think it’s fantastic that the idea has spread to Chicago. As we chatted about it and I whined about how I wished there was something like that in Seattle, but I was too busy to set it up myself, Deb suggested that I look to see if there was something similar to that in Seattle that I could join. Of course, that was one of those brilliantly sensible suggestions, that you simply must follow up on. A bit of browsing on the local cycling blogs revealed Menstrual Monday, a women’s social ride held on the first Monday of every month. After a couple of days of dithering, I decided to go. I wasn’t sure what to expect. I’d only been on one group ride before, a rather ill fated outing with co-workers a couple of years ago. Would I be able to keep up? How far would we go? Would people be friendly? I knew I wouldn’t have enough time to go home and back again, so I decided to ride to the Seattle Center directly after work and then grab a quick bite to eat before the ride. The first thing that I realized was how small a section of the city that I’m familiar with by bike. The area around the Seattle Center is called Lower Queen Anne. It’s a reasonably dense urban neighbourhood, though much quieter than downtown. The traffic is steady, but not crazy. All the same, I was nervous on the streets. Although some of the major streets have bike lanes, I wasn’t confident that I could find the taco place I was looking for, particularly if I needed to make a left-hand turn, and I defaulted to riding on the sidewalk. Which, I should mention, is legal in Seattle, though not my preferred strategy. I can also ride VERY slowly so, no, I wasn’t endangering any pedestrians. It certainly took me back to my first days riding my bike in the city and renewed my sympathy for everyone just learning to navigate a city by bike. Clearly, I need to get out of Ballard more often. Still, I got there, had my fish taco, and headed out to the Seattle Center. I found a few likely-looking women with bicycles, sitting on the grass. We chatted as more people rolled up. By 7 pm, there were 13 of us, which is apparently their best turn out yet. A lot of us, perhaps 2/3, were new to the group, which is always reassuring. 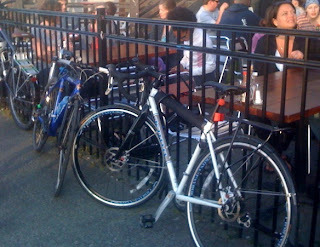 The monthly theme was “Tour de Patio”, so we decided to go to El Chupacabra, a restaurant/bar in West Seattle. It was really fun to ride with such a big group, and streets that would have been intimidating on my own felt quite comfortable. The pace was pretty easy on a road bike and I had no problem keeping up – in fact, I actually coasted part of the way. After threading our way through the construction detour on Alaskan way and passing over the lower West Seattle Bridge, we reached the Alki bike path. I’d forgotten just how pretty Alki Way is. It’s near the waterfront with an amazing view of downtown Seattle across Elliott Bay. West Seattle has a different look and feel, with a southern California beach town atmosphere. I really must go there more often this year, though we may drive and just bring the bikes.. Because of all the construction, the trip there is not particularly kid-friendly – plus it’s pretty from Ballard (when towing a kid). After about an hour’s ride, we reached El Chupacabra, found spots to park our bikes and pulled up a few tables on the patio. 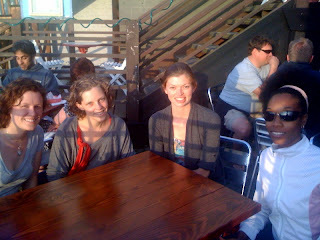 I enjoyed the nachos and a margarita, and had a really good conversation with some pretty cool women. Unfortunately, I didn’t remember to take a photo of myself, so you’ll have to trust me that I was there! Finally, at about 9 pm, a few of us decided that we had to go home, while the other hardy souls went to a second bar. I was glad to have some company for the trip back, as the construction detours are a little confusing. Still, we all made it safely back to downtown, where we went our separate ways. I continued up to Ballard myself. The Elliott bay trail is not so much fun at night – it’s very dark. Thank goodness that I have a new bike light, or it wouldn’t have been possible to go by that route. Once I made it back to better light streets, I really booked it to try to get to the locks before they closed at 11 pm. I made good time – only to discover that they closed at 9! I don’t know where I got 11 pm from – the Land of Wishful Thinking, I guess. So, I had to make my way back to the Ballard Bridge. Luckily, traffic was very light, so it wasn’t too daunting. Still, it’s not how I’d chose to navigate a new route. Once I got back to Ballard, all was easy – the streets are have adequate lighting and I know the best quiet streets, so night riding was a piece of cake. All in all, I had fun and I’ll definitely do it again. However, if it’s a trip east or south, I may take the car so that I don’t have to ride all the back to Ballard at night. I rode 32 miles that day (counting my morning commute)! 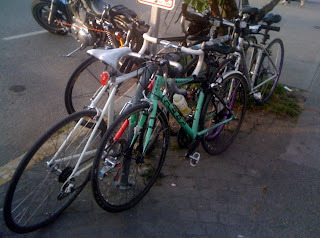 Cycling is usually a solitary or family activity for me, and I found the social aspect of this ride to be a lot of fun. It also made it clear how much of a rut I’ve been in lately for cycling routes and how many fun parts of the city are out there waiting to be explored. Frankly, I sometimes need something like this to push me a little bit out of my comfort zone. This ride certainly did that, in terms of route, distance and the amount of night riding. However, it was great to learn that I could ride fast enough to keep up with a social group and that I have a decent amount of stamina if I take a comfortable pace. Looks like a wonderful time! Social rides are such a great way to explore new places, and you meet the greatest people. PS: El Chupacabra = best name for a pub ever. Although perhaps the owners didn’t mean it as a Futurama reference. LOL, the legend isn’t particularly old, but it is more widespread than that (http://en.wikipedia.org/wiki/Chupacabra). Though, who doesn’t love a Futurama reference?